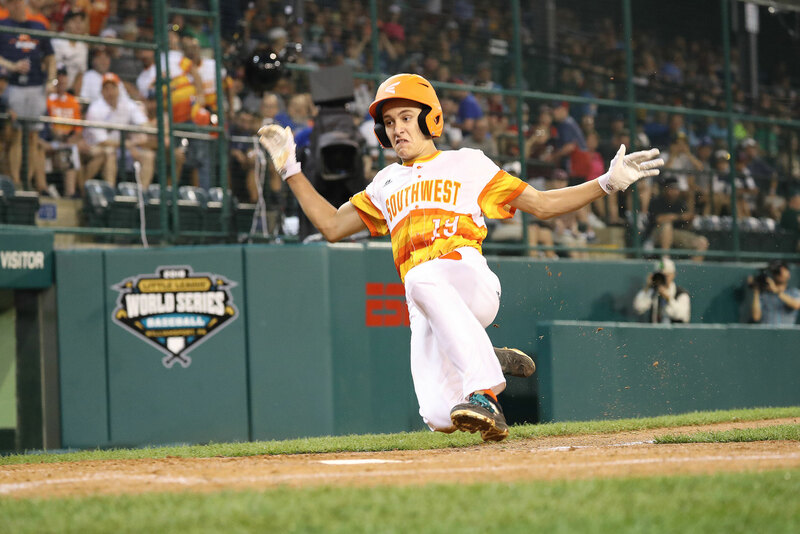 Both teams were strong on the mound on Thursday night in the finale of the first day of games at the 72nd Little League Baseball World Series, but Southwest was just a little bit stronger at the plate in a 3-1 victory over New England. Tommy Turner started the game for the New England Region Champions Coventry Little League, recording 14 outs. The team from Rhode Island tallied the first run by way of error. Post Oak Little League, the Southwest Region Champions, put the game away with two runs in the third inning. In the third frame, Ryan Selvaggi tripled on a 0-2 count, scoring one run. Carter Pitts was the winning pitcher for Southwest. He lasted 4 1/3 innings, allowing two hits and one run, while striking out six. Selvaggi closed game out, recording the last five outs to earn the save for Southwest. Turner took the mound loss for New England. He went 4 1/3 innings, allowing two runs on four hits, striking out seven, and walking one. Sammy Fuentes and Jake Mather each collected one hit to lead New England. Justin Michaelis went 3-for-3 at the plate to lead Southwest in hits.